Julie Lugones’ skill in media relations stems from more than 15 years of experience leading public relations programs for some of the biggest names in the consumer electronics and information technology segments. Prior to co-founding Fusion Communications, Julie worked in corporate communications at MasterCard International, where she teamed with the vice president of communications to fully integrate a new network of public-relations firms reporting directly to the regional headquarters in Miami. 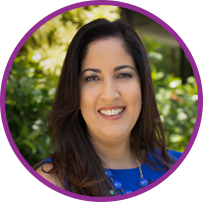 Prior to joining MasterCard, Julie worked in corporate communications for the Miami-based marketing firm GrupoUno International, where her client roster included Palm Latin America, Canon Latin America, Seagate, Yahoo! en español, and Sony-Ericsson. In previous communications positions, Julie executed U.S. Hispanic campaigns for Nestlé USA, Colgate-Palmolive and Merck Publishing Group. She coordinated media events for such clients as United Airlines, Apple Computer, Disney World on Ice, Bvlgari, Christofle and the Miller Freeman Jewelry Couture Conference. She also worked as a news writer for WSVN Channel 7, Miami’s Fox affiliate. Julie is a graduate of Florida International University, where she earned a Bachelor of Science in Communications with a minor in Marketing.